refreshing peppermint scent it has as well. I find the scent helps uplift my mood when I am stressed out when I am using it on my feet. The natural nourishing and moisturizing ingredients in this natural peppermint foot lotion that I like are the sunflower oil, vegetable glycerin, coconut oil, baking soda, wheat germ oil, tea tree oil, witch hazel, beeswax, peppermint oil, parsley leaf oil, orange wax, vitamins, rosemary, menthol, and minerals. These ingredients are what really help repair dried out crack feet as well. 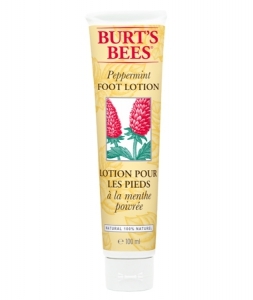 I like to use this lotion on my feet to help maintain their softness and prettiness. However, in the wintertime my feet do tend to dry out more, but as soon as I apply this lotion to my feet twice a day they soften right back up again. have a spa moment. I do usually use this foot cream every single night otherwise my feet become sore and really dried out. Anyways, I do hope those of you who use this peppermint foot cream like the way it works. I know I do and thought it was a very affordable natural foot lotion to get and use. I will be getting more of this product in the near future. I wish you all the best at keeping your feet beautiful and happy feeling. Burt s Bees is a well known, truly loved brand. It s products are very natural. They ve even started to make their own makeup. From experience, their products are amazing. True to their description. I disagree but sort of agree. It depends on your body type and how your body reacts to the lotion. You may need more so if you apply a little then go to bed, your feet will still be dry. It d be better to use during the day, to get the correct amount and feel for the product.